This 2.5 hour Adventurous Food Tour (Private) is not for the faint of heart. 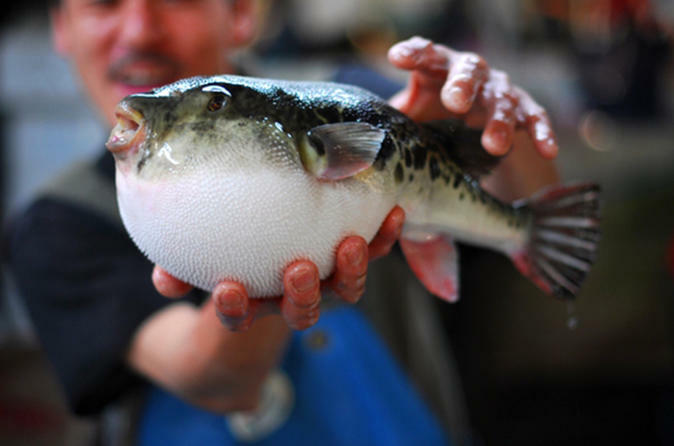 Instead of your usual sushi, ramen and curry, taste some of Japan's most notorious delicacies, such as blowfish (fugu), horse sashimi, and other foods you may not be able to try outside of Japan. When people think of Japanese food, they normally think of sushi, ramen, tempura, udon, kare raisu (rice with curry) and the like, but there are other Japanese delicacies that are popular and common to locals that many who visit Japan may never try. In this 2.5 hour private food tour, embark on a memorable food adventure guided by an English-speaking tour guide and, most importantly, a local foodie. Guests will weave through the crowded streets of Ginza, and visit restaurants serving local delicacies that are not for the weak-stomached, such as blowfish (fugu), horse meat, and more, along with traditional foods such as sushi and yakitori. While many people can say they have had the best ramen and sushi in town (some of which you will try in this tour), you will also be able to say that you've had by far the most interesting and adventurous food in Tokyo!